The International Council for Science (ICSU), of which IUPAC is a member, announced a new 10-year initiative named Future Earth to unify and scale up ICSU-sponsored global environmental-change research. Operational in 2013, this new ICSU initiative will provide a cutting-edge platform to coordinate scientific research to respond to the most critical social and environmental challenges of the 21st century at global and regional levels. "This initiative will link global environmental change and fundamental human development questions," said Diana Liverman, co-director of the Institute of the Environment at the University of Arizona and co-chair of the team that is designing Future Earth. "Global environmental change affects our ability to access food, water, and energy. It increases our vulnerability to hazardous events, and erodes our ability to eradicate poverty," said Liverman. "Only by actively engaging natural sciences, social sciences, and humanities and by working with the full range of users and producers of knowledge, can we provide a full understanding of global change and its impact on societies and ecosystems." Future Earth will have a new global governance body and secretariat, building on the strengths of existing core global environmental change programs, which are co-sponsored by ICSU. 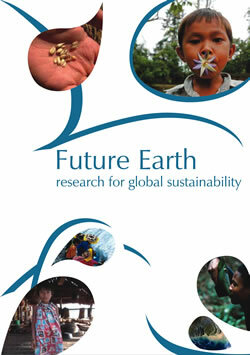 The program was officially launched in June at the United Nations "Rio+20" conference. "We are very proud of the enormous scientific achievements of the ICSU-sponsored Global Environmental Change Programs over the last decades," said Yuan T. Lee, winner of the 1986 Nobel Prize in Chemistry and ICSU president. Lee stressed that "unifying the different efforts through this new broad partnership will provide the step-change needed in international research coordination to face the challenges posed by global environmental change." He added, "the enthusiasm and engagement of the whole community will be essential to the success of this endeavor." Page last modified 10 July 2012.